Our sponsored rider Amber Major tells us about her recent selection for the Nottingham Trent University Rider Development Squad. Says Amber: “The squad receive free training from some of the best Midlands-area trainers including Sam York (BE U18 trainer and BE accredited coach, BHSI, Senior Lecturer ), Kirsty Hardstaff, Liz Taylor and Andrew Fletcher (4* eventing dressage judge). 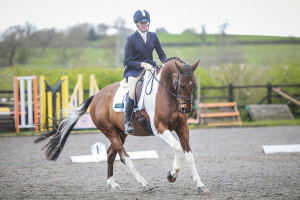 We’ve also just been lucky enough to have a lesson with Irish Olympic event rider Jonty Evans. “It all goes to support riders that can use the extra coaching and expertise to further their ridden education alongside their Equine course at Nottingham Trent University. The group of five are a fantastic team and we all get along very well with the horses abilities complimenting each other. “Personally what I get out of the Rider academy sessions is being able to take away information from both a rider and coaching point of view and the sessions are educational for both of my event horses. “The consistency of the training helps me keep on top of my riding and provides constructive exercises to take away and work on by myself so that I make sure every time I ride I’m achieving small goals. 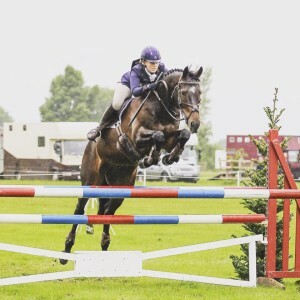 “I plan to complete my coaching certificates through the Pony Club before taking my A test after passing my AH with distinction in September 2016. I’d then like to progress to take my BHSAI exam to enable me to teach. “With my horses the academy is improving both my ability and my horses simultaneously and in 2017 I hope to aim to qualify for the Pony Club Championships again, take my younger horse to the Retrained Racehorse eventing championships at BE100 level and move my more experienced horse up to Advanced level. 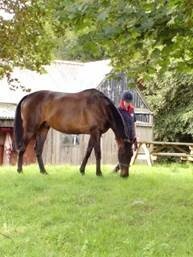 Ex-racehorse Dave, belonging to Stephanie Firth is one of the many horses to benefit from Equerry Conditioning Mash. 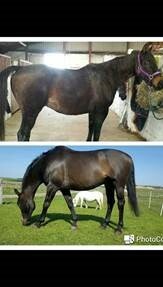 “I got Dave five-months ago, he is an ex-racehorse and had been turned away for the winter and was very thin, with a very dull coat when I got him. I have been feeding him your Equerry Conditioning Mash which he absolutely loves and the difference in him is amazing, he has put weight on and his coat is so shiny I barely need to brush him. 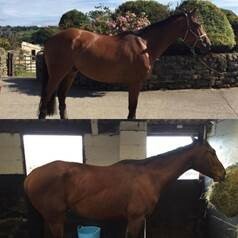 Ollie owned by Carole MacDonald has gained weight and his skin and coat are now glossy and healthy since feeding Equerry Conditioning Mash. We are always delighted to hear from customers when products from the Equerry range have made such a difference so when Eileen Melvin wrote in and sent us this stunning photograph it made our day. Each month the team at Equerry Horse Feeds run a great competition on facebook – the Equerry Horse of the Month! 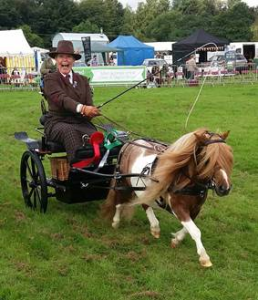 Su Woodcock and five-year-old miniature Shetland stallion, Foldhouse Little Lord Valentine, AKA Frank the Beast known to his friends. Could your horse be Equerry Horse of the Month? All you have to do is visit the facebook page for a chance to win a bag of Equerry of your choice. 2. Comment on the Facebook post with the product you would like to win and don’t forget to Like & Share the post. Entries close December 31, 2016. Equerry Horse Feeds sponsored event rider, Bonnie Fishburn has been on great form this season and to mark her success received a host of awards recently. Heading to the Tushingham & District Riding Club awards evening, Bonnie was overwhelmed with the many awards her and the horses received. Said Bonnie: “Elfie and I were second in the 75cm Show Jumping and first in the 80cm Combined Training. Then Florence and I were second in the Novice Dressage, second in the 105cm jumping and first in the Elementary Dressage. “To add to the evening, we also took runner up in the Senior Dressage and also won the Senior Club Overall Champion for 2016.